The preserved remains of 50-million-year-old sperm has been discovered in the wall of a fossilized leech cocoon in Antarctica. That’s 30 million years older than the previous record. It should come as no surprise to learn that fossils like these are exceptionally rare. Delicate creatures like earthworms, leeches, and their relatives are comprised almost exclusively of soft tissues, and can only become fossilized under very special circumstances. In this case, researchers from the Swedish Museum of Natural History were able to identify fossilized spermatozoa embedded and preserved within the secreted wall layers of a 50-million-year old citellate cocoon (a class of annelid worms) from Antarctica. It’s the oldest fossil animal sperm yet known. The details of this study can now be found at Biology Letters. Some of the features of the spermatozoa are similar to those found in modern Branchiobdellida, a strange group of leech-like worms that resemble freshwater crayfish. That’s interesting because these extant creatures have only ever been discovered in the northern hemisphere. “If our identification is correct then it implies that this group of animals had a much greater geographic range in the Eocene than they do today,” noted study co-author Steve McLoughlin in ABC Science. Scanning electron micrographs of the Antarctic annelid-cocoon fossils showing cocoon structure and included spermatozoan fragments and bacteria (a–j), with images of extant branchiobdellid spermatozoa for comparison (k–n). Image and caption: B. Bomfleur et al., 2015. The researchers say that cocoons take several days to harden, and during that time microorganisms can get trapped and fossilized in the cocoon’s walls similar to the way insects get entombed in amber. 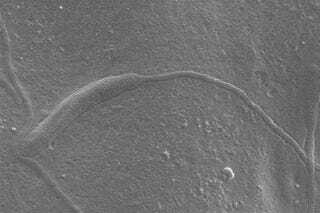 Using a scanning electron microscope, the researchers measured the sperm at about 60 micrometers long. In general, the sperm featured a long screw-like acrosome (the ‘head’), an ornamented region containing the nucleus, and a long, slender whip-like tail. The previous record for “world’s oldest sperm” belonged to a 17-million-year-old crustacean discovered by Mike Archer from the University of New South Wales. Interestingly, he’s not completely convinced that the recent discovery is that of fossilized cells, arguing that the samples should undergo MicroCT/synchotron scanning for a more definitive determination. Much more at ABC Science. Read the entire study at Biology Letters: “Fossilized spermatozoa preserved in a 50-Myr-old annelid cocoon from Antarctica”. Contact the author at george@io9.com and @dvorsky. Image credits: Department of Palaeobiology, Swedish Museum of Natural History.